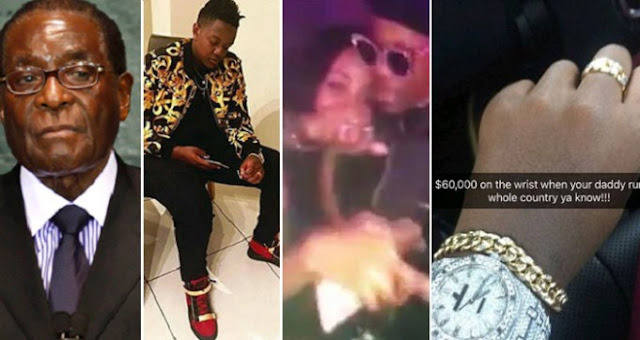 President Robert Mugabe‘s son, Chatunga Bellarmine Mugabe was videoed pouring £200 champagne over his £45,000 (N21,000,000) wrist watch. 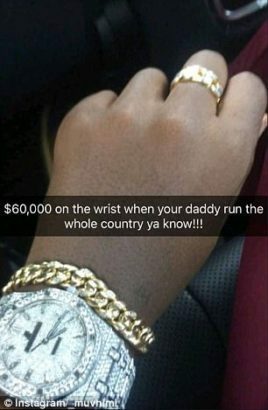 According to him, he can purchase such luxurious accessory because his “daddy run the whole country” – the Zimbabwean President’s son was videoed as he partied in South Africa. He uploaded the video to his Snapchat hours after bragging that he got the £45,000 (N 21 million) timepiece because ‘daddy run the whole country,’ as he filmed himself pouring hundreds of pounds worth of champagne over his diamond-encrusted wristwatch. The footage, filmed in a nightclub, shows Chatunga enjoying a life of unimaginable wealth while almost three quarters of the country lives below the poverty line. The champagne identified as Armand de Brignac Ace Of Spades gold, retails for about £200. The video appeared online just weeks after Mrs Mugabe announced she is suing a Lebanese jeweller for failing to deliver a £1million diamond ring she bought to mark her 21st wedding anniversary with dictator husband, Robert Mugabe. Ahmed claims to have received threats from officials from Zimbabwe’s spy agency as well from Grace herself and her son from her first marriage, Russell Goreraza. 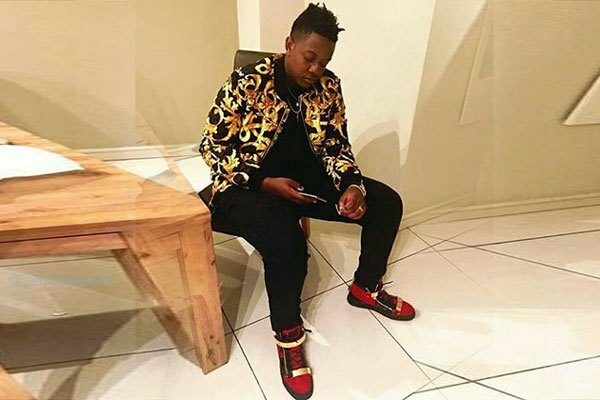 Goreraza himself is also no stranger to a life of luxury, having reportedly imported two Rolls Royce limousines worth £4million into the country recently. Recall, the pair caused an international incident earlier this year while in South Africa, after they disappeared on a wild night out, prompting their mum, Mrs Mugabe to go looking for them. Finding 20-year-old model Gabriella Engels instead, Mrs Mugabe allegedly beat her over the head with an electrical plug when she was unable to say where her boys had gone. That led to a warrant being issued for Mrs Mugabe’s arrest, though she was eventually granted diplomatic immunity and allowed to leave the country.